While some kids may fear clowns, others love them! And even if they fear clowns themselves, the best way to beat that fear is to join the crowd, right? 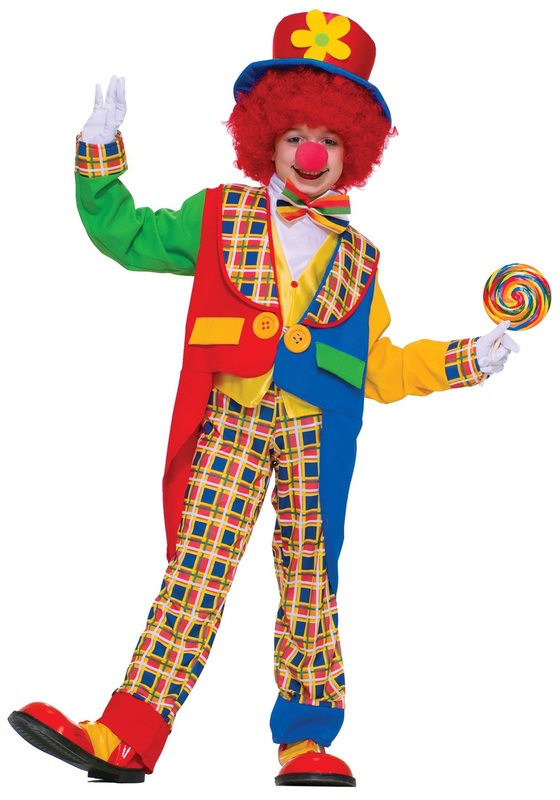 This Children's Clown Costume is a cute and funny costume idea for kids to wear while out trick-or-treating this year. Your child will want to practice juggling or do a funny dance to entertain the crowd when they put on this funny kid’s clown costume. Not everyone was born to entertain under the Big Top, but we think your child is just what the circus has been looking for (and we’re sure you tell them that all the time!). This child clown will turn your child’s frown upside down (literally!) with all of the pizazz a clown costume should have. The yellow vest has an attached white undershirt to provide a good base layer. The red and blue jacket has green and yellow sleeves and is the perfect over layer to the base shirt. A colorful bowtie is attached to the vest as well as red buttons for a detailed look. Two faux pockets are sewn at the hips with big orange buttons. Matching pants are included that have an elastic waist for a comfortable fit and they have red and blue cuffs for even more clown-like detail. A yellow daisy foam hat is also included to top off this funny look. Pick up a wig, a clown nose, and some funny big red shoes to get them really looking the part! Don’t forget about the clown makeup! this was a great costume great value!! It was much better quality than I thought it would be for the price ..it was true to size ..lots of fun very colorful.. my 5 year old twins had a blast! !